If you’re not already growing an herb garden it’s time to start. Herbs are anti-inflammatory and antioxidant superstars; they are high in fiber and flavor and low in calories, making them excellent for healthy weight loss; and they can be used both internally and topically for a wide range of health promoting purposes. Plus cooking with herbs that are still fresh helps to maximize their nutrient content and flavour. Oregano – This herb is a good source of fiber, calcium and potassium, plus nature’s allergy busting, anti-histamine compound-quercetin. It’s superstar nutrient however is carvacrol, which has potent anti-inflammatory and antimicrobial properties. Try infusing oregano in oil over 2 weeks and using it topically as a disinfectant and pain reliever, or internally (a few drops under the tongue) to enhance digestion and help fight colds, flu and other infections. [i] Oregano pairs well with pasta, olive oil and tomato based dishes. *Oregano can irritate the mucous membrane and pregnant woman should consult with a physician before consuming it. Lemon balm – Super easy to grow, lemon balm is rich in vitamin C and antioxidant-dense phytochemicals including tannins which have natural astringents and antiviral properties.The fresh leaves can be added to a hot bath, or infused in water or diluted vinegar and used as a skin toner or shine enhancing hair rinse. [ii] This uplifting herb is great for aromatherapy and repelling insects and quite versatile in the kitchen — it can be added to salads, soups, stews, sandwiches, desserts, dressings, beverages and most protein dishes. Peppermint – Peppermint has inflammation, spasmodic and bacteria fighting properties. Traditional medical practitioners use mint for a range of digestive health purposes including relieving gas, indigestion, heartburn and infant colic, and increasing bile flow. [iii] Boil mint to make a soothing tea or try adding it to salad and cheese dishes, chocolate-flavored desserts, lemonades and Greek cuisine. Cilantro – Also referred to as coriander, this herb is an excellent source of vitamins A, K and C, manganese and fiber. [iv] Cilantro acts as a natural chelator, helping to bind to toxins and dangerous heavy metals such as lead and mercury and safely remove them from the body. [v][vi] Cilantro makes a great addition to salads, soups, stews, seafood dishes, salsas and most Mexican cuisine. 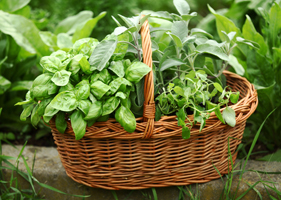 Basil – Basil is easy to grow and thrives both indoors and outdoors. It’s rich in fiber, bone health promoting vitamin K, and antioxidant flavonoids. Ancient Chinese medicine practitioner use it for promoting kidney health and healing skin disorder as well as gum ulcers. The leaves can be used for a refreshing and invigorating bath or as a hair follicle stimulating hair rine. [ix] Fresh basil makes an excellent addition to chicken (think chicken pesto), salad, most Italian dishes and as a garnish on sandwiches.